Be honest. 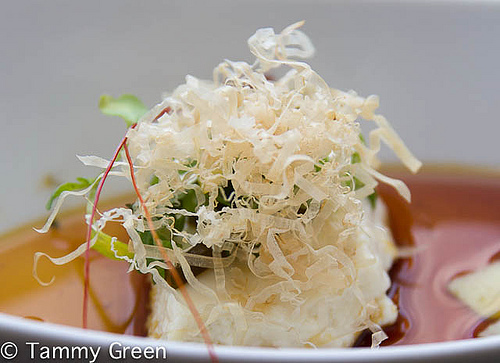 Have you drooled over Chef Takashi Yagihashi’s food on Top Chef Masters this season? Me, too. Luckily, Chicago diners can turn off the television and head to either of Chef Takashi’s French-inspired Japanese restaurants in the city. Takashi Restaurant (1952 North Damen Ave.) is the fancier of Chef Takashi’s restaurants, and a reservation is highly recommended. It’s perfect for a dress-up date night or a special occasion, though still within reason for a weekday splurge. If you arrive early, choose from an indoor table where you can watch Chef work the pass or select a patio seat and watch the world pass. Let the weather be your guide. If you have a hearty appetite, I recommend placing yourself in Chef’s hands and selecting the omakase menu. Popular items like the savory pork belly served as an open-face sandwich and delicate silky tofu with umami-ginger sauce are represented, so you don’t feel like you’re missing anything. 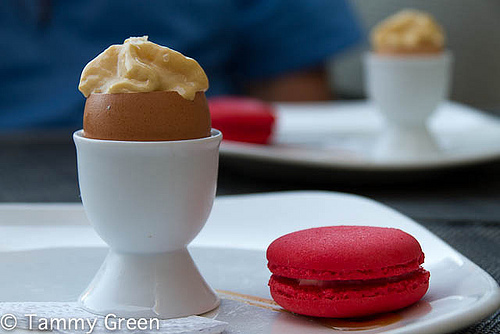 The spectacular caramel and cream filled eggshell with a tart macaron side-car are the punctuation on a delicious meal. The wine selection is well rounded, though it seems a shame not to drink from the sake menu. The knowledgeable serving staff are happy to help you navigate the menu and sample if you’re unsure of a choice. Slurping Turtle (116 West Hubbard St.) Seating is first come, first serve at Slurping Turtle. If you’re flexible about communal dining tables or eating at the bar, then you’ll fit into the casual, raucous atmosphere. The concept at this restaurant? Easily shared food that is at turns satisfying and surprisingly spicy. I usually graze from different sections of the menu: some ceviche with tangy yuzu dressing, a few pieces of sashimi or grilled enoki, and the incredibly addicting Brussels sprouts from the specials menu. Or, I tuck into a bowl of Chiyan Pon, fried egg noodles with the perfect balance of broth, veggies and seafood. A splash of hot mustard sends my taste buds zinging and adds to my definition of comfort food. Though I’m usually stuffed silly by the time I get around to dessert, it’s hard to pass up a green tea cream puff or a raspberry wasabi macaroon. I haven’t built up to the quail egg and coconut milk shooter though it’s definitely on my list of things to try. Wine, saki and cocktails are all represented, though Slurping Turtle usually puts me in the mood for a pitcher special of Kirin. 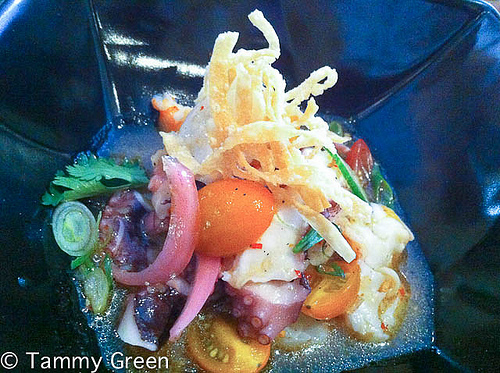 Try the ceviche at Slurping Turtle. If you’re debating about which of Chef Takashi’s restaurants to try, I’ll make the decision easy for you: try both! Especially if you want to enjoy the range of food, from casual to cuisine, that a Chef can produce. This entry was posted in Dining and tagged omakase, Slurping Turtle, Takashi, Takashi Yagihashi, Top Chef Masters. Bookmark the permalink.